Freddy Beans is shocked by SKYSCRAPER! 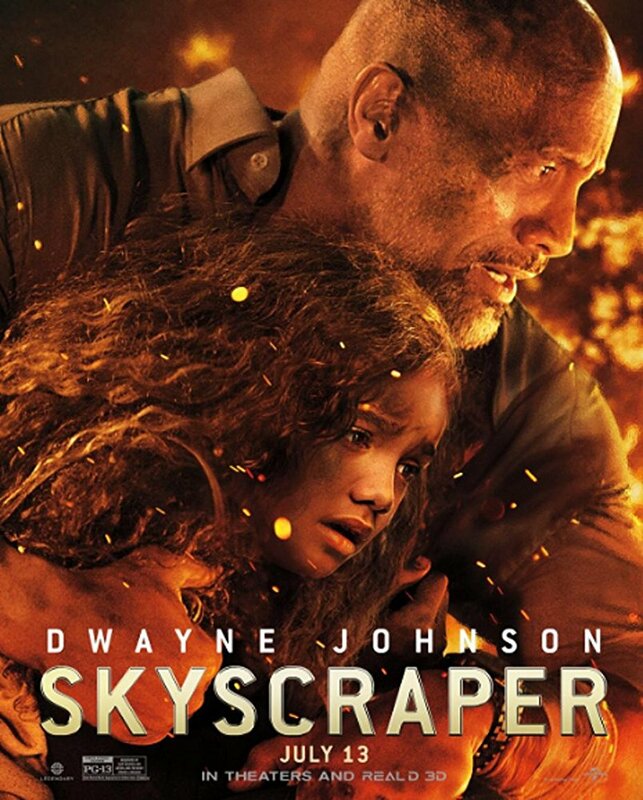 Freddy Beans here with a review of SKYSCRAPER starring Dwayne "The Rock" Johnson! Will Sawyer (Dwayne Johnson) opens the film in a hostage situation that’s clearly turned violent, what with the dead cop near his still running police cruiser. It’s a situation he miscalculates and pays for, losing his leg in the process. Next thing we know Will is preparing himself nervously, a huge opportunity for his security business with his navy surgeon wife (Neve Campbell) and 2 kids, Henry and Georgia (Noah Cottrell and McKenna Roberts), there for moral support. Long story short, Will gets to assess the security risks of the tallest high rise on the planet, a 225 stories tall skyscraper located in Hong Kong. Zhao Long Ji (Chin Han) created the structure, dubbed - the Pearl, “City in the Sky” a tiered skyscraper with a terrarium, RAMPAGE-sized wind turbines that light up the entire electrical footprint, apartments and a hard to explain indoor dome that substitutes as a pretty convincing funhouse of mirrors when the timing is right. Yep, each of those layers is explored and plays a key role in SKYSCRAPER. Will’s family gets invited to the high rise while he hangs with his old SWAT team member, Ben (Pablo Schreiber). Ben was also caught up in that earlier hostage situation coming away with burns that resemble bad acne. Will lost a leg and Ben comes up with a bad complexion, not bad for facing a guy wrapped in explosives, I say! A digital necessity is stolen, and the fires begin on the 90th floors, thrusting us into the movie as Will has to save his family, who are trapped on the upper floors. Without ruining the story (There really is more story but it’s derivative and mostly not needed) Will Sawyer has to find a way back into the burning building while being chased by the Hong Kong SWAT team, and a conveniently located crane at floor 100 comes in mighty handy with that! The actors do a pretty swell job here. Neve Campbell holds her own and I swear she didn’t bite her bottom lip once! The kids are adorable, even if they are filler. And Dwayne Johnson ditches the comedy he’s known for, attempting a more mature style of acting that fits him well. It’s maybe the wrong movie to go all “Mr. Serious” though, I mean this is a movie made for comedic moments to adeptly mix in with the action. Yet it works. I think I’d like to see Mr. Rock jump into more serious roles, though my favorite role still goes to PAIN & GAIN, love Mr. Johnson in that one! Rawson Marshall Thurber directs here, surprisingly not jumping into the easy comedy to lighten this roller coaster up. Instead giving this a serious tone I just wasn’t expecting from the director of CENTRAL INTELLIGENCE/WE’RE THE MILLERS/DODGEBALL: A TRUE UNDERDOG STORY. I like that he expanded on what he does well. He got me to sit through a 1 hour 42 minute film of a burning building people are trying to get into. Nicely done sir. The special effects are awesome, though a bit redundant by movies end. That money shot with Will hanging by the skin of his digits is truly terrifying. Well, if it wasn’t a movie with Dwayne as the main actor I might have been more worried about him. The movie is littered with implausible situations with acceptable and entertaining results. This is THE TOWERING INFERNO meets DIE HARD mixed into a corny-flavored heaping of digestible gooeyness. Families will love this film. Believe me, it shocks me to say that I recommend checking this one out. I wanted to dislike it or be completely unimpressed, and while there are the predictable tropes, I must say, I had a damn good time with SKYSCRAPER. 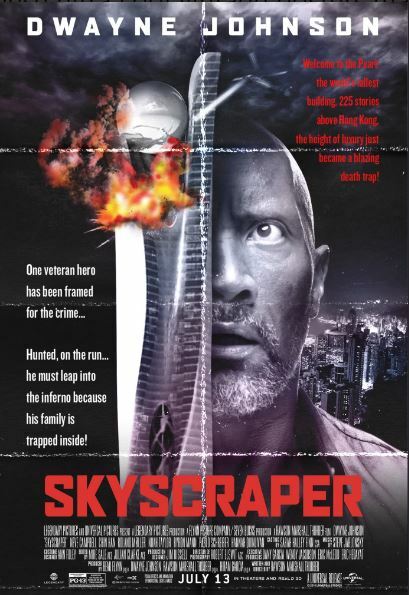 SKYSCRAPER opens nationwide this Friday, July the 13th.